Our family trip to Jamaica was more than just a fun vacation. My mom did tons of research on the best all-inclusive resorts for families and finally settled on a Beaches Resort in Jamaica. The main reason she decided on this was because of the Sandals Foundation and the programs they offered to help give back while on a vacation. When my mom told us about Pack for a Purpose and Reading Road Trip, my sister and I were so excited. Here we were about to go on an amazing family trip and when we went we were going to get to meet local kids and give back! I decided to use being President of my school to my advantage. First I asked my mom if it would be OK to hold a school drive to collect supplies so we could take even more supplies than just what we purchased. My mom was a little hesitant at first because she had read quite a few things saying to only bring so many supplies to avoid duty fees when entering Jamaica. Ultimately she decided it was for a good cause and if we were charged duty fees then so be it! I talked it over with my teacher and the principal. They thought it would be a great idea to hold a school wide drive to collect supplies to take with us on our trip to give to schools in need. 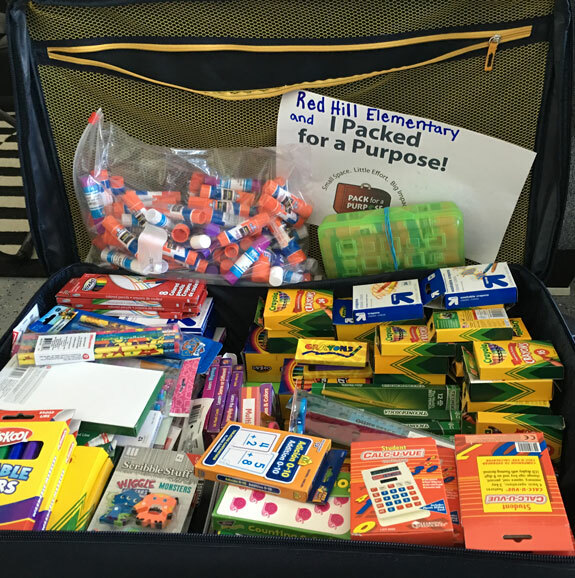 We collected almost double the supplies we expected! All the supplies filled our biggest suitcase we took to Jamaica and weighed over 50 pounds . My mom decided to start an Instagram account that she would post daily about our trip for students and parents to follow along. 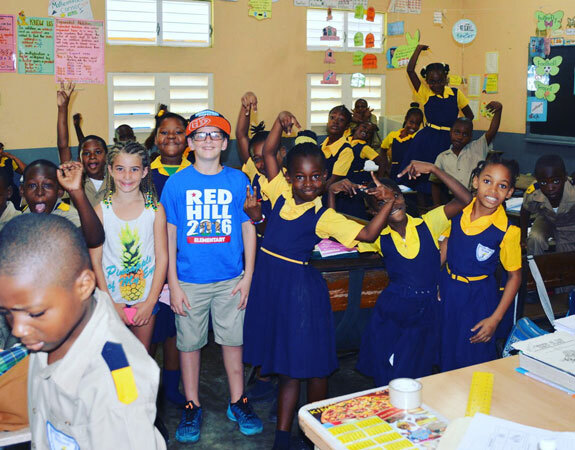 When we got to Jamaica, I couldn’t wait to deliver the supplies because I knew the kids were going to be very excited. We checked into our hotel and let the employees know we had supplies for the schools. 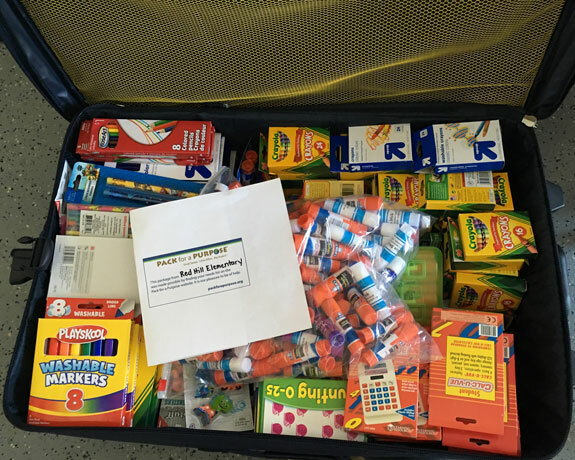 The employees thanked us over and over, and they could not believe how many supplies we had brought. I told them I was President of my school and I had asked to hold a drive to collect supplies. One of the employees working at the front counter went and got me a Sandals Foundation beanie baby and told me it was so great to see youth wanting to help out! My mom got a call from the front desk telling her that the person in charge of the Sandals Foundation for our hotel had stopped by the hotel and wanted to meet me when she was there. Unfortunately, we didn’t get a chance to meet her. 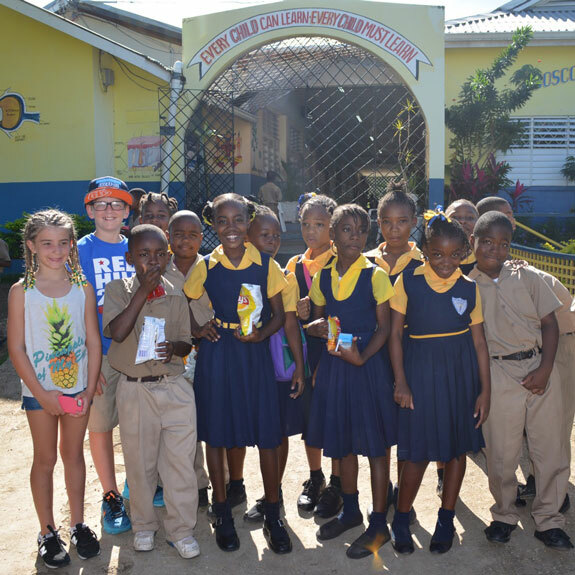 When the day came to go to the school, we got on the bus to head over to Boscobel Primary. When we arrived the kids were having snack out front. It was so different from our schools back home. The kids looked very happy to see us. While they ate snack we took pictures with some kids and toured the school. The kids were all so friendly. Walking around the school really made me realize how lucky we were back home. There are so many things at our schools that we take for granted. I did not realize that there are places all around the world who don’t have the equipment and resources that we have at our school. 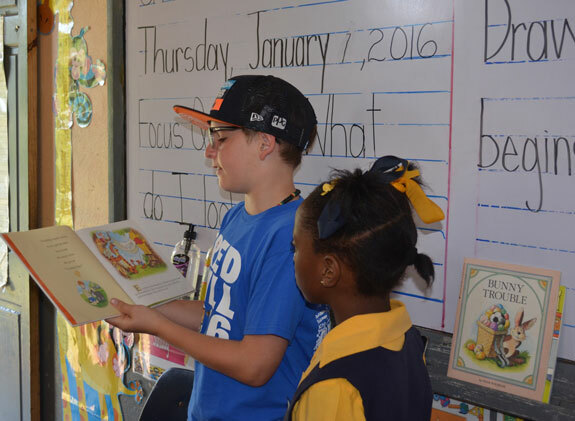 After checking out the campus, we went into the classrooms to read to the kids. After we read, the kids sang songs for us and then thanked us and my school Red Hill Elementary for all the supplies. I was sad to leave but happy that I could help a community with less luxury than many communities have.